Inkspire Me: A Spooktacular Extension! 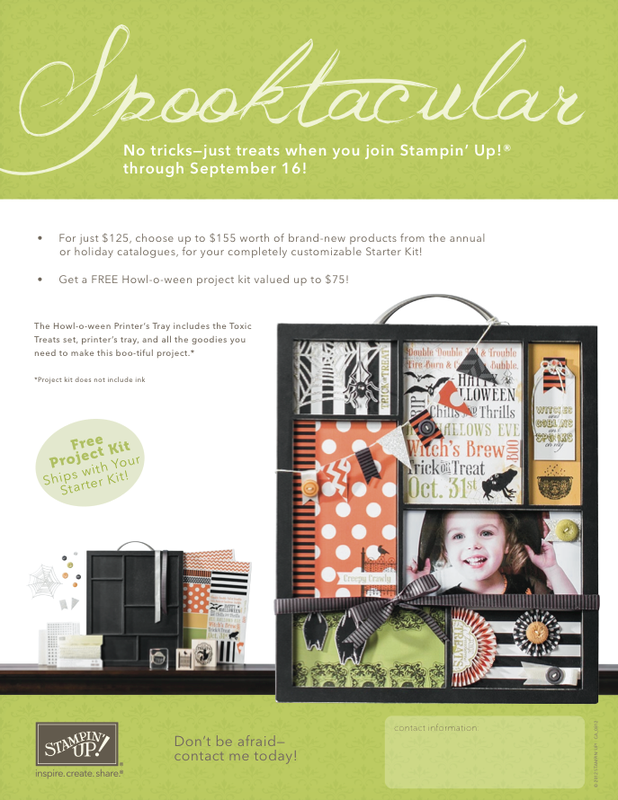 Do you remember that Spooktacular deal in August when you joined my Stampin' Up! team of demonstrators? Well, I've got great news...it has been extended until September 16! Yep, that's right, if you sign up with Stampin' Up! before September 16, not only will you get your starter kit for $125, a $225 value; but you'll also get the Howl-o-Ween project kit, valued at $75 for FREE. Absolutely FREE! The kit contains an exclusive printers tray and everything you need to make a spooktacular decoration for Hallowe'en, including the Toxic Treats set featured in the Holiday catalog (p. 25). Contact me today to learn more about what a Stampin' Up! demonstrator does. You can also check out my past post, Common Misconceptions. If you're ready to take the plunge, simply visit my website, and click the "Join Now" button.